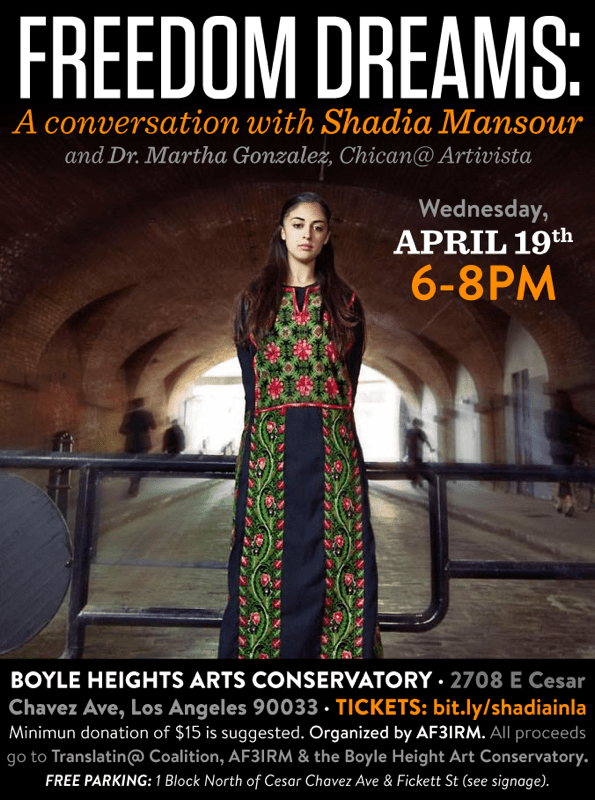 LOS ANGELES– As part of AF3IRM Los Angeles’ ongoing theory building process, we invite you join us for a intimate conversation and performance with Shadia Mansour, “the first lady of Arabic hip-hop”, and Dr. Martha Gonzalez, Chicana Artivista and Scholar, to learn and explore how a female Arab Hip-Hop MC is resisting against the Politics of fear by articulating our imaginaries of liberation through music. We are living in a critical moment: Fascism and Xenophobia are becoming a trend globally, police are becoming militarized and military response to conflicts is being normalized, people are dehumanized for simply crossing borders in search of a dignified life, criminalized for simply being black or brown, and ostracized and killed for challenging heteronormative standards of sexuality. In the current reality, poetry and imagination help produce language and consciousness to articulate a collective vision of liberation–our freedom dreams. Who better than artists and cultural producers to engage with and create spaces for dialogue as we embark in this process? Artists have always infused movements with hope and creativity, encouraging us to dream beyond the conditions in which we are forced to live. Dr. Martha Gonzalez is a Grammy Award™ winning singer, songwriter, artivista, PhD, feminist music theorist and Assistant Professor in the Intercollegiate Department of Chicana/o Latina/o Studies at Scripps/Claremont College. She has performed at the Kennedy Center for the Arts and the Smithsonian and worked with musical artists Jackson Browne, Los Lobos, Tom Waits, Susanna Baca and many more. A Fulbright (2007-2008), Ford (2012-2013) and Woodrow Wilson Fellow (2016-2017) her academic interest in music has been fueled by her own musicianship as a singer/songwriter and percussionist for Grammy Award winning band Quetzal. The relevance of Martha and Quetzal’s music and lyrics have been noted in a range of publications, from dissertations to scholarly books. In addition, Martha has made a considerable impact in the Los Angeles Chicano music scene and around the country.